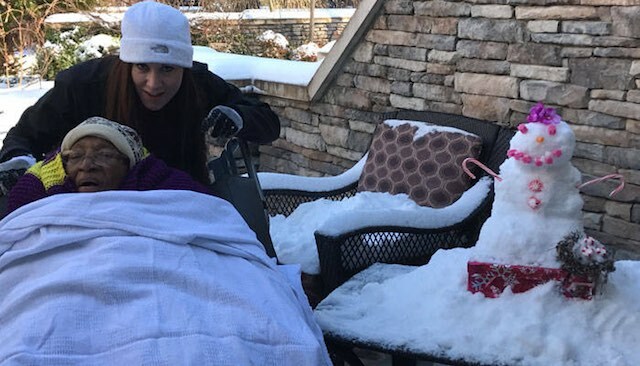 While some people may be cursing the winter storm that hit the East Coast this weekend, these hospice workers used it to grant a woman’s dying wish. Ionia Moore, an elderly hospice patient at the Testa Family Hospice House in King’s Mountain, North Carolina, has been hoping for snowfall since Thanksgiving. The 87-year-old rejoiced when – on Sunday – the staff took her out on the snowy patio for some fun. Employees Rebecca Beach and Melissa Bridges built Ionia a little tabletop snowman that was strategically placed so that the senior will be able to see it from her room window. “Mrs. Moore is a VERY happy lady! Thank you to these amazing staff members who went above and beyond the call of duty to make a patient’s day,” said Testa Family officials.